The PM130 Series uses our ultra-slim sensors, which are designed for setups where space is critical. Measuring only 0.75" x 0.2" at the photodiode location, the ultra slim sensor fits where most sensors cannot. Available with Si or Ge detectors, they cover a wavelength range of 400-1800nm and power range of 5nW to 5mW. The built in sliding ND filter extends the power range to a maximum of 500mW. The filter position is automatically detected by the console. 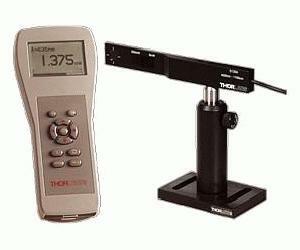 The PM130 Series with the slim sensor (Si or Ge) is ideal for measurements in dense setups with space constraints. The slideable ND filter allows the user to easily change the power measurement range to 500mW. Additionally, two threaded holes allow easy mounting of the sensor to any of our standard posts.